James Vernon “Timex” Hoback, 43, an auto mechanic from Pilot, sits in a Charleston, WVa jail these days after admitting that he — as a member of the Pagan’s Motorcycle Club — helped two fellow club members from Roanoke smuggle C4 explosives and two hand grenades from Virginia to West Virginia for use in the club’s ongoing war with the Hells Angles. Hoback copped a plea in federal court in Charleston recently and could face up to 10 years in prison when he is sentenced on March 8 next year. He is one of 55 club members and affiliates of the Pagan’s named in a 44-count indicment issued under the federal Racketeer Influenced and Corrupt Organizations (RICO) act. The indictmens charge the Pagans with operating a criminal enterprise and using violence and intimidation to control that enterprise in illegal activities from New Jersey to Florida. Other counts accuse gang members and associates of kidnapping, robbery and attempted murder for conspiring to kill an incarcerated member of the Pagans whom they believed was cooperating with law enforcement. The indictment also alleges that proceeds from illegal raffles — purportedly for non-existent motorcycles — were funneled into the criminal enterprise. According to Hoback’s stipulation, Charles H. “Tombstone Charlie” Nichols, of Roanoke, Va., obtained the explosives and gave them to Hoback, who in turn gave them to Richard Howard Leslie “Reverse” Smith. Smith, 58, also of Roanoke, Va., took the C4 and hand grenades to Ronnie Howerton, a member of the Pagans who was known to be collecting weapons to use against the Hell’s Angels, in Princeton, the stipulation states. “Hoback helped transfer the explosives to Howerton with the intent that the explosives would be used to kill, injure or intimidate another individual,” the stipulation states. Although Smith and Nichols were named in the indictment, Howerton was not. Nichols died last month while in custody at the South Central Regional Jail. Authorities said Nichols died from complications from previous medical conditions. 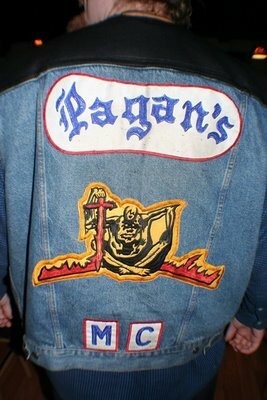 The Pagan’s consider Southwestern Virginia their turf and have a long history of bad blood with the Hells Angels. A Floyd County Pagan was arrested in 2003 under another RICO case that rounded up 73 members of the club.